FORT LAUDERDALE, FL--(Marketwire - October 18, 2010) - As MSC Poesia completes her inaugural Canada/New England cruises from New York and Quebec City, MSC is counting down to another exciting Caribbean cruise season featuring memorable destinations, special theme sailings, and an unparalleled onboard experience. When MSC Poesia sets sail from Quebec City on October 23, she begins a 9-night repositioning cruise taking her through Sydney, Boston, Newport and New York before heading to Fort Lauderdale. Alternating 7-night Eastern and Western Caribbean cruises through February 27, 2011: "Western Caribbean Wonders," cruises call at Key West, Florida; Ocho Rios, Jamaica; Georgetown, Grand Cayman; and Cozumel, Mexico; "Eastern Caribbean Enchantment," cruises call at Charlotte Amalie, St. Thomas/Virgin Islands; Philipsburg, St. Maarten; and Nassau, Bahamas. "Baseball greats" cruises are featured on several MSC sailings this season and offer free guest/player activities including a player-hosted trivia game, question-and-answer session, guest pitching contest, and a lively story-telling session. Players also will host skills clinics and participate in a free autograph session. "Baseball Greats" will be featured on the November 14, January 9 and 23 and February 6, 7-night Eastern Caribbean cruises and the December 5, 7-night Western Caribbean cruise. MSC Poesia's Caribbean cruise season ends with a 17-night Eastbound transatlantic cruise, "Bluewater Adventure," on March 6, 2011 calling at San Juan, Puerto Rico; St. John's, Antigua; Port Castries, St. Lucia; Funchal, Portugal; Malaga, Spain; Alicante, Spain; Barcelona, Spain; and Genoa, Italy. 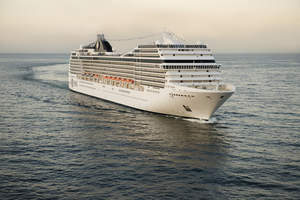 For more information about MSC Cruises, visit us online at www.msccruisesusa.com, call 877-665-4655, or contact a local travel professional.